OOTD - Grey Knits for Fall + Marc by Marc Jacobs Fran Bag | La Petite Noob | A Toronto-Based Fashion and Lifestyle Blog. Monday has arrived, and this Noob can't help but feel a little bummed - this past weekend had been fantastic weather wise and filled with fun fall-themed activities. Sunday was a little chilly, but still comfortable enough for the ever coveted sweater weather - with just a few extra knit accessories to stay warm and cozy. I chose to dress in various shades of grey knits atop a monochromatic black bottom that gives the optical illusion of longer legs - perfect for this 5 foot nothing gal! This sort of outfit will be one that I will definitely fall on as a regular uniform as the colder weather hits because if it's simplicity and warmth. Read on for additional photos and all outfit details. I received this black and gold Marc by Marc Jacobs Fran bag as a gift a couple of years ago, and it has been a cold-weather staple for me ever since. I love how big and roomy it is, and it's versatility between the shoulder handles and the removable cross body strap. The bag, as with most Marc by Marc Jacobs bag, is a bit on the heavy side so I am mindful not to stuff it and just travel lightly. 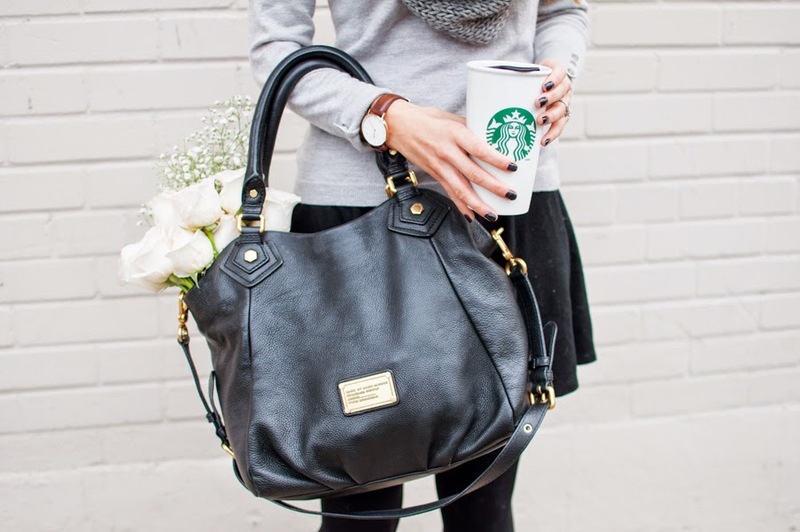 Love just about everything about this look, including the flowers and Starbucks cup! :) Beautiful! Thanks Claire - I think that you would look beautiful in grey! You look so pretty, love the flowers in your bag such an elegant touch! What a beautiful outfit! I love the hat and the scarf! These pieces are essential to feel cozy this autumn! I love this! Grey and black are definitely a go-to combo for me in the cooler months. :) Just curious, what was the temperature when you wore this outfit? It's cooling off here but I'm having difficulty deciding whether or not to wear a coat and then what kind of coat...I'm either too cold or too warm!